We know that you all are waiting for SSC CGLE 2016 Tier 1 result (Cut-off Marks), Probable dates of Tier 2, Change of post Preference, Tentative Vacancy etc. 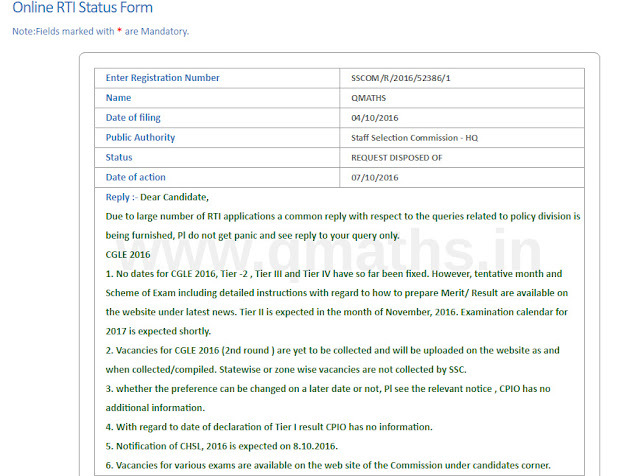 we had filed RTI Query to SSC and SSC replied today with the following information. Due to large number of RTI applications a common reply with respect to the queries related to policy division is being furnished, Pl do not get panic and see reply to your query only. 1. No dates for CGLE 2016, Tier -2 , Tier III and Tier IV have so far been fixed. However, tentative month and Scheme of Exam including detailed instructions with regard to how to prepare Merit/ Result are available on the website under latest news. Tier II is expected in the month of November, 2016. Examination calendar for 2017 is expected shortly. 2. Vacancies for CGLE 2016 (2nd round ) are yet to be collected and will be uploaded on the website as and when collected/compiled. Statewise or zone wise vacancies are not collected by SSC. 3. whether the preference can be changed on a later date or not, Pl see the relevant notice , CPIO has no additional information. 4. With regard to date of declaration of Tier I result CPIO has no information. 6. Vacancies for various exams are available on the web site of the Commission under candidates corner. We advise all aspirants to believe in official sources only.